Remember Nimbula, the startup from Amazon(s amzn) Web Services veterans Chris Pinkham and Willem van Biljon that launched in 2010 amid a firestorm of private-cloud activity in every direction? Well, now it’s part of Oracle(s orcl), the two companies announced Wednesday morning. On March 13, 2013, Oracle announced it has agreed to acquire Nimbula, a provider of private cloud infrastructure management software. Nimbula’s technology helps companies manage infrastructure resources to deliver service, quality and availability, as well as workloads in private and hybrid cloud environments. Nimbula’s product is complementary to Oracle, and is expected to be integrated with Oracle’s cloud offerings. The transaction is expected to close in the first half of 2013. It’s difficult to say at this point what inspired the deal, but my early assumption is that it’s a win-win. Oracle currently has a cloud computing strategy that’s questionable at best, and its private-cloud strategy seems hinged on selling big, expensive, over-engineered systems with some legacy Sun Microsystems and Oracle software cobbled together to make them, cloudy. 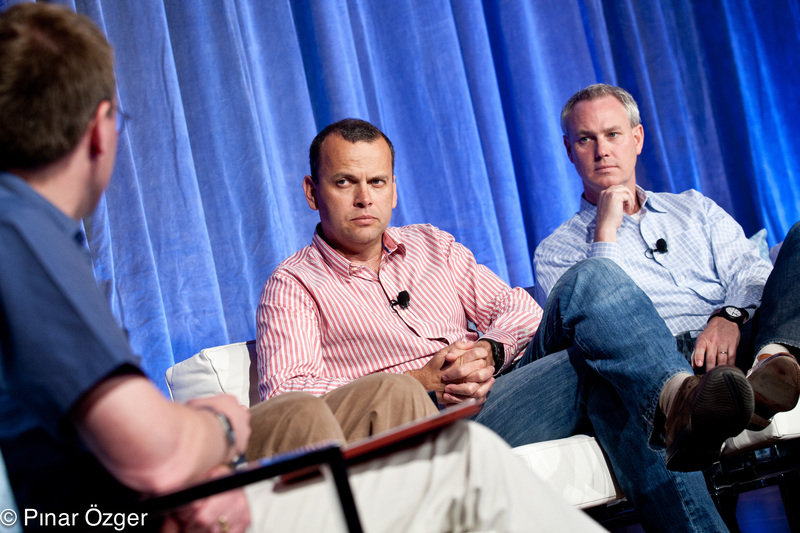 Nimbula co-founder Chris Pinkham (center) at Structure 2011. Nimbula was on the scene early and, from all accounts, built a good product, but appears to have succumbed to a lackluster private-cloud buying market. It has a handful of publicly named customers, including Russian search engine giant Yandex, but like so many other private-cloud startups, it might have fallen victim to market confusion (i.e., “Can’t we just keep buying VMware(s vmw)?”) and an industry consensus around OpenStack as the private-cloud savior. Indeed, last year, Nimbula made a strong pivot and actually began rebuilding itself as an OpenStack distribution. Maybe Oracle just needed some real cloud talent and/or software and Nimbula just needed a buyer. At any rate, we’ve reached out to Nimbula, Oracle others for comment and will update this story as we hear back. I thought 2012 was the year of acquisitions in the cloud market.. But I was wrong! Now what I am thinking is, wasn’t Nimbula performing/growing well under the ex. management? Article andout M&A and no information on the value? What sort of research is that? Nothing like a great insiderâ€™s account to understand what truly hides behind these acquisitions in the software industry. To understand how IT companies use fraud, insider trading, manipulation, deceit, and various legal and accounting schemes as part of a corporate acquisition, I cannot recommend enough, “High-Tech Planet: Secrets of an IT Road Warrior” written by a former Oracle executive who saw it all. It is available on Amazon where you can read the first chapters for free. Bet Oracle got ’em for a song. There will be a lot more deals like this throughout 2013-14.